The EcoHitch® hidden hitch for the 2009-2016 Audi allroad is designed to be completely concealed so you only see the receiver once it's installed rather than having to see a crosstube underneath your vehicle. With the Audi allroad EcoHitch you can take your bikes, extra cargo and so much more! Rated for 300 pounds tongue weight and 2,000 pounds towing weight, it’ll have the strength to keep up with the rugged yet sophisticated allroad. *If you’re going to be towing and need trailer wiring, click here! Ensure your wiring harness does not drag on the ground by visiting our Eclipse trailer wiring bracket. With the Audi allroad, adventurous spirit rides shotgun so why not let this trailer hitch for your Audi allroad ride along in the back? A perfect example of versatility and a turbocharged ride, we’ve created the perfect hitch for the allroad that complements the design without changing style, efficiency, or ground clearance and is only visible when installed. 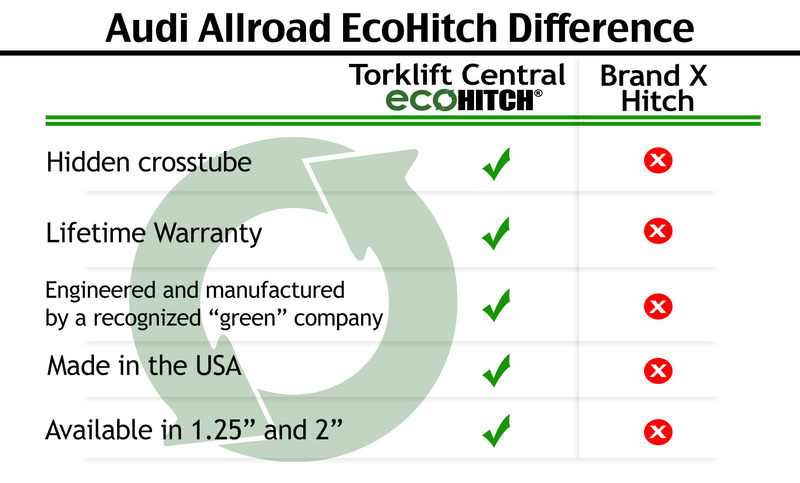 The EcoHitch® hidden hitch for the allroad comes in both 1¼” and 2” receiver sizes so you get your choice of which bike racks and cargo trays that will work best for the receiver you choose. With 300 pounds tongue weight and 2,000 pounds towing weight capacity, our Audi hitch is engineered to meet stringent national SAE J684 standards and give you the ability to find new horizons without having to leave anything behind.